The Philippines is a sports-loving nation—from boxing to basketball. Seven years ago, the government even named the martial art known as Modern Arnis as our national sport. But the country’s actual national sport may be the political election. The Philippines has just gone through a campaign season that engaged the whole country to a degree I have not seen before—and made news all over the world. It culminated in electing our new president Rodrigo “Rody” Roa Duterte, a lawyer and former mayor known for outrageous populist rhetoric that has drawn comparisons to what Americans are currently hearing from U.S. presidential candidate Donald Trump. Duterte’s elevation has occasioned worries about the future of the Philippines. But it has also produced great hopes for the future. As a veteran human rights and democracy activist for more than 40 years, I have felt both emotions in these elections and their aftermath. Elections demonstrate the best and worst of this country. The best is the enthusiasm, the excitement, and the energy of voters who insist on interacting directly with candidates and take seriously the right and responsibility to vote. Media coverage is enormous, with all candidates receiving dedicated TV and radio coverage, befitting the stakes and the intense national interest. The Commission on Elections (Comelec) estimated that 81 percent of the 55.6 million registered voters cast ballots in the most recent elections. In fact, it’s common to see voters wait four or five hours in a queue before casting a ballot. That wait, though, is part of a problem. For all our affection for elections, the process itself can feel bastardized. Vote buying remains far too accepted a tactic. And our candidates lean on showbiz antics and even political violence. Too many of our politicians are unprepared and unqualified members of elite political families. Widespread election deception is not only part of the story of the Philippines, but part of my own history working for democracy. In 1969, the controversial re-election of Ferdinand Marcos, in votes marred by massive election cheating, made clear that his presidency was sliding into dictatorship. In 1972, martial law was declared. By that time, I was part of the anti-Marcos movement fighting the dictatorship. In 1974, I was jailed as a consequence. After being released eight months later from a military camp, I joined a larger movement that exposed Marcos’ violations of human rights to the world. When the dictatorship finally fell in 1986 in the face of a popular uprising, I helped file—and eventually win—a case in Hawaii requiring the exiled Marcos and his family to compensate victims of his human rights violations. The Institute for Political and Electoral Reform, where I’ve worked since the early 1990s, was established to help test and strengthen our country’s burgeoning democracy. For all our affection for elections, the process itself can feel bastardized. Vote buying remains far too accepted a tactic. And our candidates lean on showbiz antics and even political violence. During this election season, as part of my work with the Institute, I traveled throughout the country to talk with people about the elections and the process of putting them on. I visited General Santos City (hometown of the new senator and famed boxer Manny Pacquiao), Cotabato City (where the rebel Moro Islamic Liberation Front has its headquarters in Camp Darapanan, on the city’s outskirts), Tacloban City (the epicenter of supertyphoon Haiyan destruction), Cebu City (home to the largest concentration of voters in any province), Kiangan in the province of Ifugao (where General Yamashita surrendered the Japanese forces during World War II), and San Fernando, Pampanga (the home province of former president Gloria Macapagal-Arroyo). Excited and enthusiastic, people I visited with frequently asked for whom they should vote, indicating how seriously they took their civic responsibility. But there was also deep concern about how the elections were conducted, and whether votes were being counted accurately. In places with armed conflict, local authorities drew up detailed plans to deal with the various rebel groups in different parts of the country or with local political warlords who use threats of violence to coerce people to vote for certain candidates. During these particular campaigns, social media amplified other troubling election byproducts. Unsavory name-calling, uncouth comments, insults, and death threats—which can’t be taken lightly—were all too common as supporters of political opponents battled online. And yet I’m heartened by the election results. This year, the Philippines’ automated election system allowed for quick counting and tracking of the results. Many voters made a day of the elections, staying at the polls until the transmission of the votes in the evening. The transparency of this system meant that this year’s results were quickly accepted both by losing candidates and by the public at large. There were still reports of vote-buying, election violence, and cheating. However, these did not materially affect the national results—except in one race, for the tightly contested position of the vice president. In that election, Ferdinand “Bongbong” Marcos, Jr., the son and namesake of the late dictator, lost to Congresswoman Leni Robredo, the widow of an interior secretary killed in a 2012 plane crash. In an ironic twist, he is crying that he was cheated. I also view the election of Duterte as a watershed. For the first time, Filipinos have elected a local mayor from a far southern city, a man who was far outside of national political circles. This was part of a larger trend of voters favoring candidates who promise key governance reforms—including federalism and devolution of power to provinces. Elite candidates representing the Philippines’ old guard fared less well. For all the international media’s fixation on his strongman bluster, Duterte has a genuine mandate from the people and there is no challenge to his victory. And that in itself represents an opportunity. Duterte has said his top priority will be changing the country’s charter so that it strengthens local governments and grassroots politics. This focus on local governance is a departure from the practice of national leaders augmenting their own power. 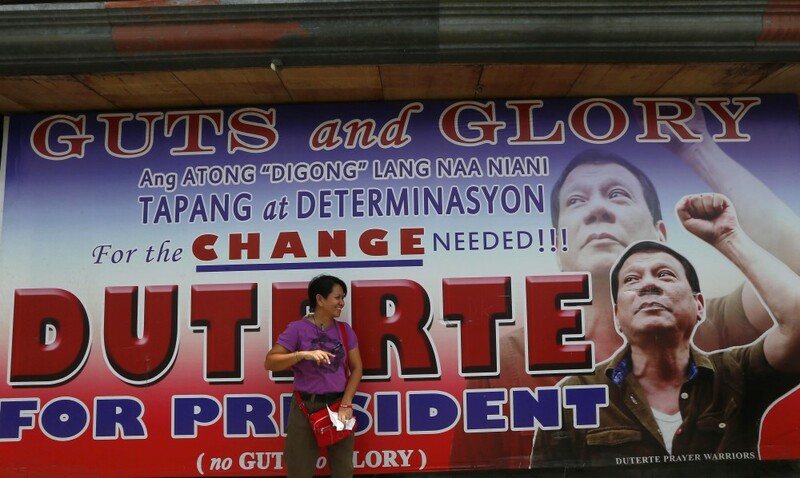 Whether Duterte will take on corruption—and fraudulent elections themselves—is harder to say. He has promised to advise and dialogue with political enemies. Perhaps the strengthening of local governments will strengthen democratic institutions, particularly if our new president fulfills his promise to include all people, including rebel forces, in his reforms. And if he doesn’t? There will be elections again, and the people of the Philippines will be there, in very large numbers. Ramon Casiple is executive director of the Institute for Political and Electoral Reform in the Philippines. *Photo by Bullit Marquez/Associated Press.